This rare bulb is a native of South Africa. 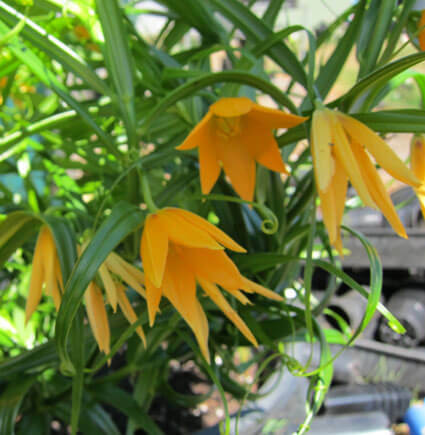 A deciduous climbing bulb that requires morning sun to dappled shade. Height to 2m and width to 1/2m. This winter dormant bulb emerges in spring with a large spine. It uses the tendrils at the end of each leaf (which it releases from its main trunk) to seek out some kind of support to fasten to as the plant grows. During summer this little treasure produces about 20 yellow (Turks cap-lily) type flowers with the most subtle honey perfume. In the autumn the foliage yellows and dies back to its bulbs for winter dormancy. Does not require lifting.